Take flight with the best-selling pack in our lineup: the Redwing. Whether your journey takes you to the streets of Chicago or the canyons of Colorado, the Redwing has you covered. Hybrid-loading U-zipper design works as both a top loader and panel loader, allowing easy access to all your gear. Large exterior front pocket organizes maps, electronics, pens, and other travel essentials. LightBeam™ single aluminum stay and Dynamic AirFlow back panel keep your load stable and comfortable. And you’ll have multiple hydration options thanks to the Redwing’s extra-large zippered side pockets and built-in hydration port. The Redwing adds convenience to any adventure! Selecting the right backpack is almost as important as selecting the right boots. It has to properly fit your frame and be large enough to carry what you need without being too heavy or falling apart. There is a delicate balance between size, weight, quality, functionality and price. In this review I will focus solely on the Kelty Redwing 50-Liter backpack and its usefulness as a 72-hour bug-out bag. When you’re choosing a 72-hour pack there are two opposing schools of thought… In my opinion, military styled packs typically have a militarized commando look about them, whereas packs designed more for hiking tend to be less conspicuous looking. What impression do you want to give off in a survival or bug-out situation? Kelty Redwing series backpacks are compact, extremely lightweight and have a sleek, attractive design perfect for trekking through dense woodland and jungle terrain. The Redwing packs provide the perfect blend of external-access side pockets while remaining narrow enough to not get in the way as you travel through the bush like traditional multi-day hiking backpacks. They don’t provide a customizable MOLLE/PAL system to overload with an abundance of gear and removable pouches that tend to get hung up on brush when it gets thick. 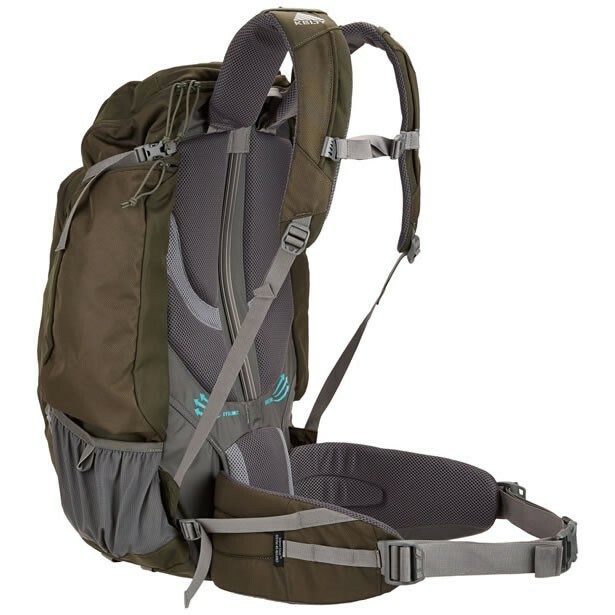 Quality multi-day packs tend to feature a some kind of underlying frame design to provide additional comfort and stability on the go. Imperative for long-distance travel, especially with any kind of load. The Kelty Redwing adjustable LightBeam suspension system is specially designed for all day comfort without adding a bunch of weight unnecessarily. It consists of a removable single lightweight aluminum stay integrated into the center of the back panel. Additionally, there is a removable HDPE frame sheet fitted just behind the Air Mesh skinned lumbar pad and Dynamic AirFlow ventilated back panel for added support and rigidity. The Air Mesh skinned shoulder straps and dual-density foam waist belt are padded and fully adjustable for enhanced comfort and load stability. The load lifter/stabilizer straps, hip belt Scherer Cinch stabilizer straps, sternum straps, and waist buckle allow you to quickly customize the fit, keeping the load off your shoulders and close to your center of gravity. Sometimes it take a little time and effort to get it setup just right, but once it is, the comfort is hard to beat. 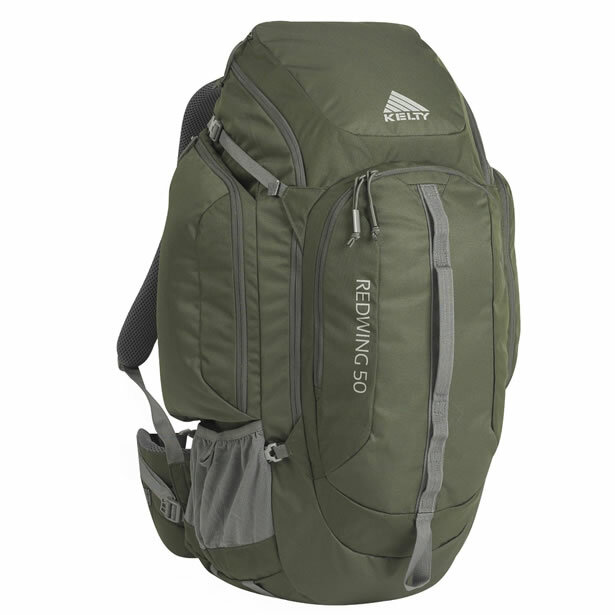 The body of Kelty Redwing series backpacks are made from 420D Polyester Ball Shadow for its superior tear and abrasion resistance, while its reinforcement panels and webbing are made from 450D Polyester Oxford for its enhanced strength and durability. The current version of the Redwing 50L weighs right around 3.25 pounds. It is available in caper, forest night and black, while the previous version can also be found in blue, orange and red. A few seams are double-stitched, but most of them are only single-stitched. However, the quality of the stitching is very high. The Redwing has a few strategically located zippered pockets and stash locations to organize your gear. On each side of the pack there is a mesh pocket, each large enough for two 1-liter bottles. Directly above each of the mesh pockets is a zippered external pocket approximately 11″ tall, 6″ wide and 2″ deep. Just behind each of the pockets is a 6″-wide pass-through area between the pocket and the main compartment capable of holding a rifle, tripod, sectional fishing pole, machete or even an axe. The large frontmost pocket is where the admin organizer is located. It is nearly 15.5″ tall, 10″ wide and 2.5″ deep. 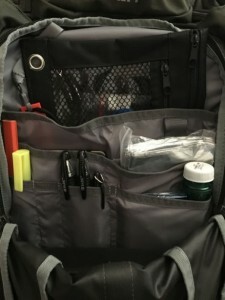 The organizer consists of 9 various-sized pockets and a key fob, two of them felt-lined and one of those has a hook and loop retention strap. Perfect for electronics like a cellphone or GPS. On the outside of the pack, running down the center of the admin pocket there is a rugged webbed strap daisy chained to provide a sturdy carry handle, an ice-axe loop and various lashing options for hooking carabiners. At the top of the pack, there is a second webbed carry handle. The Redwing 50L has a hybrid U-shaped zipper design allowing it to work as a top loader and a panel loader, allowing easy access to the main compartment. The main compartment access panel seconds as a small zippered stash pocket approximately 9″ tall, 8″ wide and 2″ deep. The main compartment itself is approximately 24″ tall, 12″ wide and 8″ deep with a pocket and strap for a hydration bladder. Directly behind the hydration pocket is the access to the aluminum stay and HDPE frame sheet. At the top of the compartment near the center of the pack there is a hydration tube passthrough port. At four strategic locations around the face of the pack, there are compression straps to tighten the load and bring the pack closer to the center of gravity. This prevents unnecessary fatigue from sudden load shifting and off-balance loads. The two topmost compression straps prevent the main compartment from opening all the way without disconnecting them first. This comes in very handy in the field. Kelty’s Redwing series packs are rugged, lightweight and well-suited for trailblazing on or off the beaten path. Their unique LightBeam suspension system and myriad of straps provide all of the comfort and stability necessary to transport your gear and supplies over long distances time and time again. The high-quality materials provide a superior resistance to abrasion and tearing for years of ardent service while keeping the pack lightweight and affordable. In a bug-out situation, I firmly believe that their sleek, contoured look would likely garner much less attention than one of the many military-style packs might which is the primary reason why I prefer this pack style. Second only to weight. Military-style packs tend to be made from heavier nylon weaves between 600D and 1050D resulting in a pack that is not only more durable, but also much heavier. A 72-hour bug-out bag is best if you can keep it down to somewhere between 25 and 35 pounds which happens to be the sweet-spot for the Redwing 50L. Any lighter than 25 pounds, you could probably use a smaller pack. Any heavier than 35 pounds, a larger pack with a heavier-duty frame would likely be in order. Loaded with all of my essential gear, I was able to get it down to about 32 pounds plus the weight of the pack. Sure, I used to be a kitchen sink kind of guy… But after many trials and tribulations, I’ve learned that less is usually more and lighter is always better on the trail. Whether you are in an urban or outdoor environment, Kelty’s Redwing packs are certainly versatile enough to get the job done without breaking the bank. They have proven themselves to be an exceptional value. You really get a lot of bang for your buck. I give them two thumbs up without a doubt. Since 1952, KELTY has built affordable, reliable outdoor gear that enables everyone, from the first-time camper to the experienced mountaineer, to embrace any experience with confidence. KELTY: The Active Family Experts. KELTY is based in Boulder, Colorado, and uses the natural backdrop of the Rocky Mountains to test, create and continually innovate within their diverse outdoor product families of Light & Fast, Trail, Basecamp and Travel gear. Kelty combines the best in new technology with a healthy dose of common sense to create exceptionally made and affordably priced outdoor products.